In the second of our series of gardening tips from Liesl, she tells us all about how her team got to the point of harvesting our crop of soetpatats this month. We harvested sweet potatoes this month, as they’re making a wintertime special appearance on the menu at Babel. The thin stemcuttings we planted in the heat of Summer did not look very impressive, but with regular watering, they quickly flourished into lush mounds of foliage. 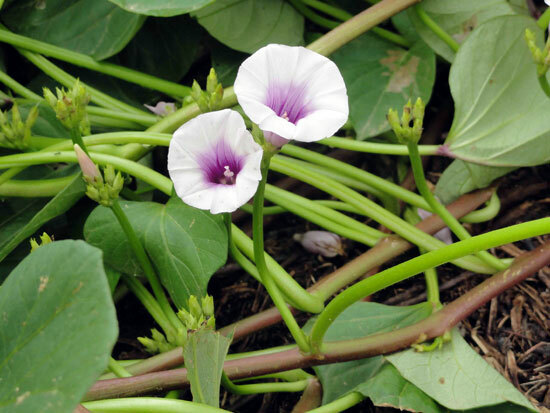 The lovely white & mauve flowers appeared late summer as the plants matured, hiding shyly underneath the leaves. About a month before harvest, we cut the leaves to encourage the roots to mature. 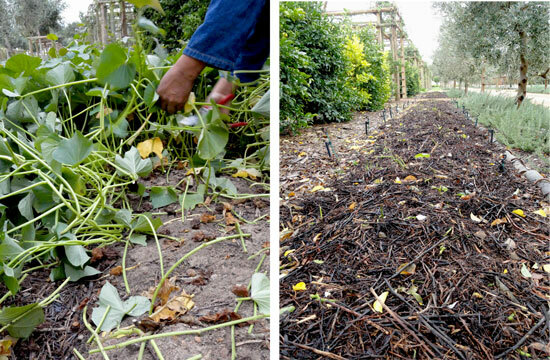 To discourage mice from feeding on the tubers, we covered the beds with a thick layer of mulch made from roughlyshredded vines – it worked well. The mice went hungry, and our soetpatats grew nicely! After 5 months in the ground, we eventually lifted the plants with great expectation and care, making sure that the moist, thin skins on the tubers were not damaged, as this helps prevent them from rotting in storage. We harvested 4 colours – white, purple, orange and yellow. The orange variety is the old fashion sweet potato known as borrie patat, while the white variety has an interesting long shape, and is more of a collector’s item for speciality chefs. The tubers are now drying in the store for2 weeks, waiting for the roots to sweeten before we send them our restaurant, where the chef, Simone, will do her magic with this exceptionally nutritious vegetable. Next time you visit Babel for lunch, be sure to look for soetpatats on the menu! Hi. I am looking for the old yellow (not orange) BORRIE patat. I grew up as a child with my mother making this either as soetpatats or baking it in the oven. I cannot find it anywhere. Where can I buy this. Dear Barney, sorry we do not have any patats at the moment, we will only plant cuttings in Oct/Nov. We’re not sure about the borrie patat, we’ll ask around. If you are on the farm that time of year, just ask one of the gardeners.